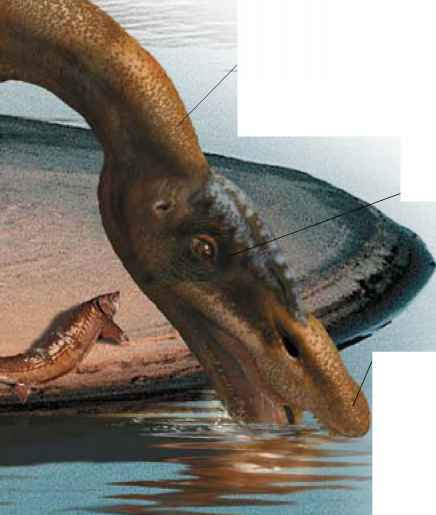 The watery landscape of Early Cretaceous Britain teemed with wildlife, of which dinosaurs were only a part. Lakes and rivers were the domain of fish, turtles, and crocodiles, and insects—especially dragonflies—were common. This dragonfly has been preserved right down to its wing veins and body stripes. A large herbivore, many Iguanodon specimens have been found across southern Britain. It lived in herds, grazing on horsetails and ferns, which it cropped with its bony, toothless beak. Cheek teeth then crushed its food to pulp before it was swallowed. Each thumb was equipped with a sharp spike, which Iguanodon may have used to stab at enemies. Prowling the landscape of southern Britain was a top predator of the Early Cretaceous. 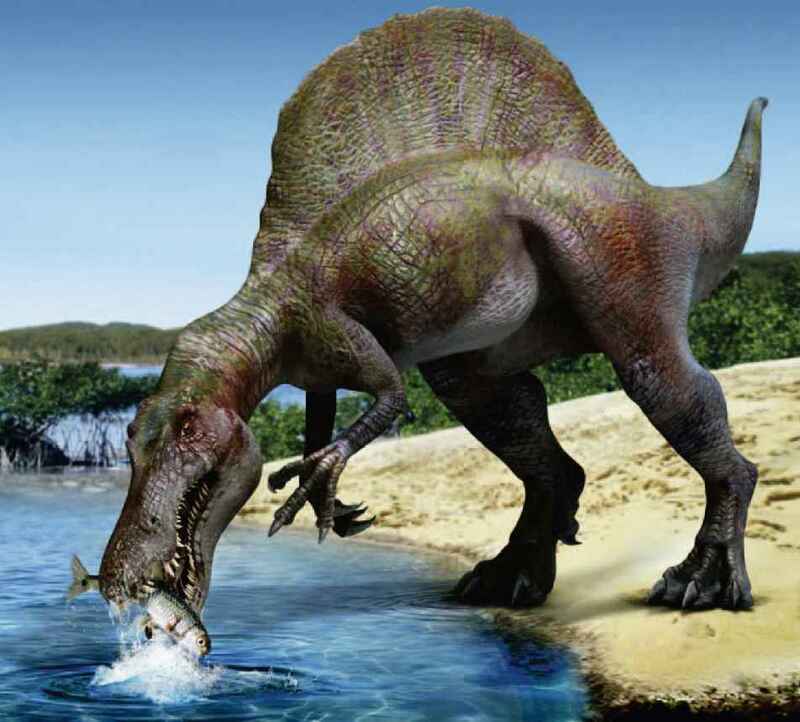 This was Neovenator, a formidable carnivore, closely related to Allosaurus of North America. Its fossils have been found on the Isle of Wight, off the south coast of England, where it might have preyed upon Iguanodon. 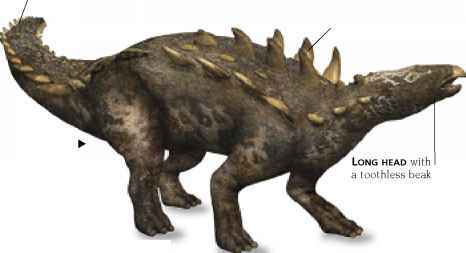 An ankylosaur (armored dinosaur) Polacanthus lived at the same time and in the same area as Iguanodon and Neovenator. Along its neck, back, and tail were rows of spikes, and over its hips was a bony shield. These features protected Polacanthus during an attack. 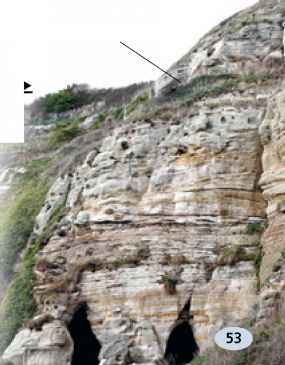 The Hastings Sands, part of the Wealden Group, seen in the cliffs at Hastings, formed about 140 million years ago. At this time, the region was part of an extensive river delta and floodplain. The cliffs are the result of sediment settling in rivers and lakes. Plant, fish, seashell, and dinosaur fossils are found here, including footprints of Iguanodon. Even Early Cretaceous sea ripples are preserved in amazing detail. 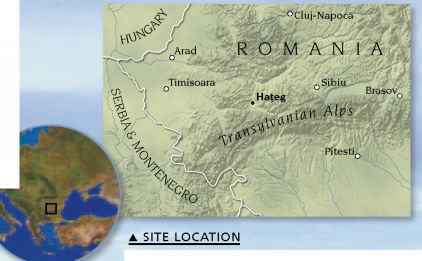 In the late cretaceous period, about 75 million years ago, the Hafeg Basin area of western Romania was an island in the Tethys Sea. 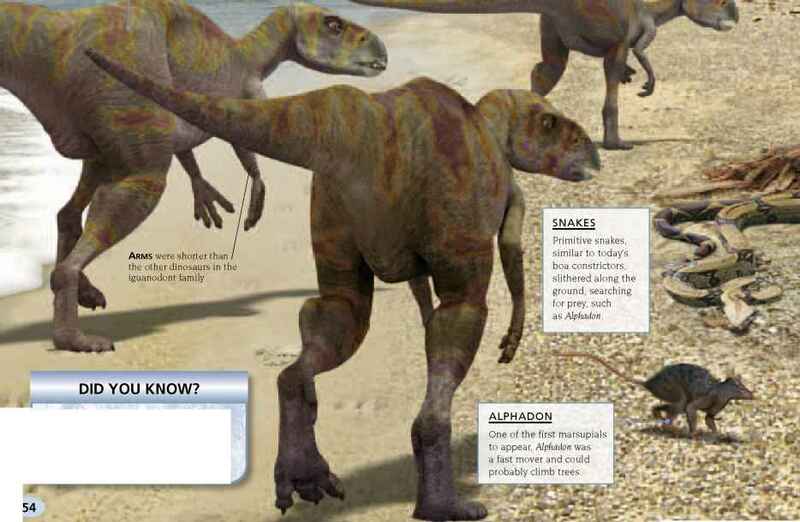 Several dinosaur families lived on the island, including titanosaurs, hadrosaurs, ankylosaurs, and iguanodonts. This was a typical Late Cretaceous dinosaur mixture, which could also be found in other parts of the world. But what made the Hafeg Island animals interesting was their size—Magyarosaurus, Rhabdodon, and their contemporaries were smaller than usual. Over many generations, the species adapted to the limited food supplies on the island by shrinking in size. Hafeg is a town in western Romania. The name comes from the island that existed in the surrounding area during the Late Cretaceous. Many fossils have been unearthed around modern-day Hafeg. One of the last of the iguanodonts, Rhabdodon was about half the size of ancestors like Iguanodon. Its bones show that it took about 16 years to grow to full adult size. Oak, maple, walnut, and beech trees grew alongside conifers, tree ferns, and cycads. The climate was warm throughout the year. Islands have continued to produce miniature species. The last of the mammoths, from Wrangel Island in the Arctic Ocean, were tiny compared with their ancestors, and the Shetland Islands, north of Scotland, are still the home of small ponies. Above the island flew Hatzegopteryx, one of the largest of all pterosaurs. From tip to tip, its wings measured 46 ft (14 m). A titanosaur, Magyarosaurus was one of the smallest and last of its family. Several incomplete fossil remains have been found in Romania. Several Telmatosaurus skulls have been found at Hafeg, together with clutches of eggs and hatchlings belonging to this hadrosaur. This plant eater was the smallest in the ankylosaur family of armored dinosaurs. It had bony studs on its neck and back while spikes guarded its sides. What is the Neovenators enemies?